As the new member of the iStick Pico family, Eleaf iStick Pico 21700 is a more powerful and high performance box mod that inherits the same compact and ergonomic design of the predecessors. 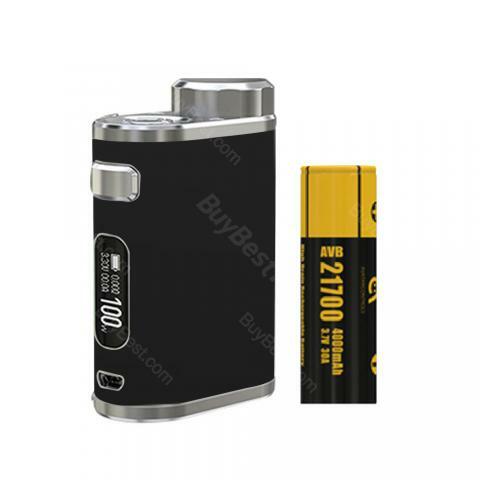 The Pico 21700 is compatible with both 21700 and 18650 batteries, supporting 100W maximum output power and various TC modes. The iStick Pico 21700 mod also includes a micro USB port for 2A fast charging and firmware upgrading. Plus a big fire button, a 0.91-inch OLED screen, and convenient top battery cap, the 100W 21700 iStick Pico is a good device that will bring you a simple and powerful vaping experience. One AVB 4000mAh 21700 Battery included in the package. • One AVB 4000mAh 21700 Battery included. You also can get other 21700/18650 batteries in BuyBest. Good prices and fast delivery! Eleaf iStick Pico ist klein, edel, sehr unauffällig und die Dampfentwicklung ist gut. Es gefällt mir sehr. Bin sehr zufrieden mit der E Zigarette!